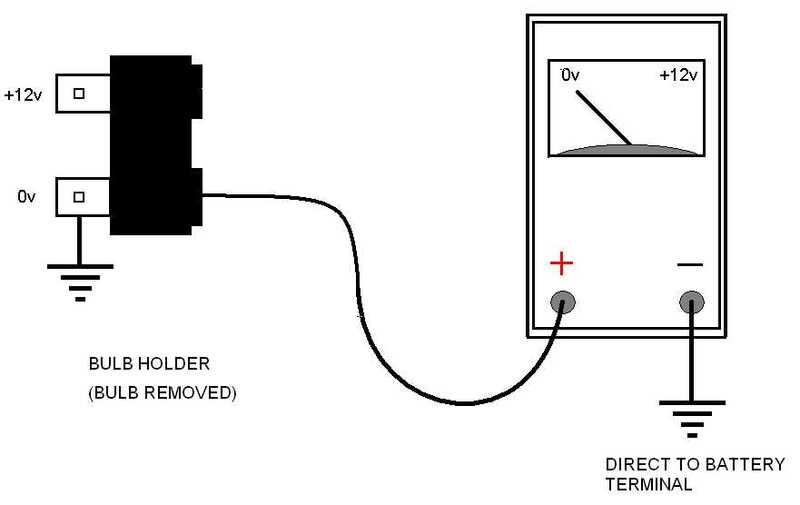 To Check/Find +12v Supply and Ground Faults in Lighting Circuits. (Not applicable to Zenon or other high voltage lighting systems). Prior to conducting the following tests it is advisable to remove all bracelets, watches and rings etc. as Very large currents will flow if the jewellery comes into contact with the positive contact and a short occurs to earth. This current can be so large that it can literally melt gold and silver right off your finger or wrist!! Do not touch the surface of the bulb if it is a Quartz Halogen type, as the grease in your skin can cause premature failure (if you are unfortunate enough to touch a Quartz Halogen bulb it can simply be cleaned using mentholated spirit and a clean lint free clean cloth). Bulbs get very hot VERY quickly take care not to touch them while in operation and for some time after power has been removed as the bulb can remain very hot for quit some time. (a) Digital Voltage Meter (DVM) or analogue multimeter capable of measuring up to 15Volts DC. With the vehicle ignition on and all ancillaries switched on (but the engine not running) make a note of the battery terminal voltage (i) (measured on the battery terminals themselves NOT on the battery terminal clamps) this voltage must not be less than +12Volts. If the voltage is lower than +12Volts check the condition of the battery and recharge or replace as necessary. Switch off all ancillaries recheck and record battery voltage (ii) should be greater than (i). Switch the ignition on only if required by the circuit under test to operate. (Do Not leave the ignition switched on for extended periods as this may damage the high voltage coil in some older bikes that use contact breaker points). (b) With the meter set to Volts the measured voltage should be approximately equal to that noted on the battery terminals [+0 -0.2Volts] (limits are in [brackets]) should be displayed. 2: (a) again with the meter set to Volts. 0.000Volts [+0.010 -0.000Volts] should be displayed. Anything above .001v is suspect! 4: Switch lights ON. Meter should read about the same as in step (2) - 0.000Volts [+0.010 -0.000Volts]. Again anything above .001v is suspect! If battery voltage on Terminal (not the crimps around the Terminal) is less than 12Volts do not continue the test until the battery has been charged. 1: If meter display is 0.5Volts less than the measured battery voltage then there is a problem with the +12Volts feed to the bulb. Track this back by measuring the cable through the harness and especially through connectors i.e. 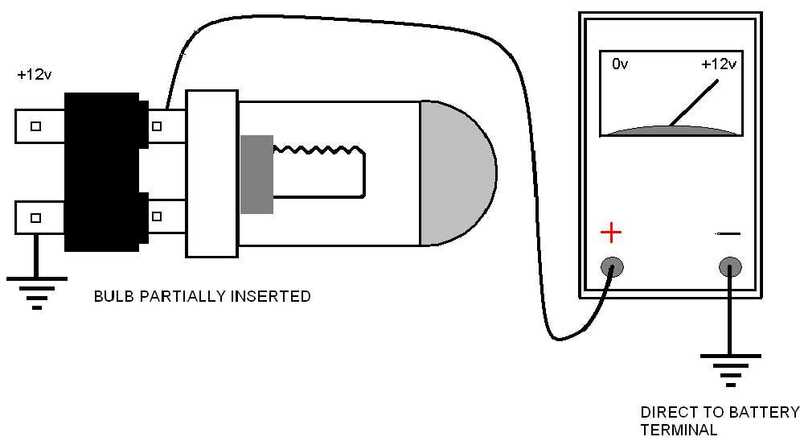 measuring each side of the connector until the excessive voltage drop is detected (do not unplug the connector while conducting the test as the load on the circuit will be removed and the test will be invalid). Note: Do not forget the battery connectors themselves, as this is a major area of contamination and voltage loss. 2: If meter display is >0.010Volts an earth fault is most likely. i.e. poor earthing or a possible partial short circuit. 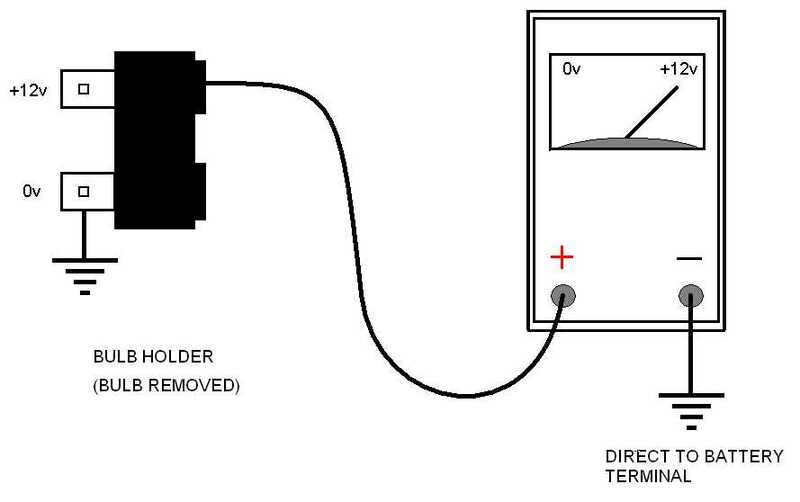 Check earths by placing the (-) probe of the meter directly on the (-) terminal of the battery (not the clamp) and place the (+) load on to the earth tag connected to the bulb holder if there is a significant difference more than [+0.020Volts] then proceed to “Fault Finding an Earth Point”. Fault Finding an Earth Point. A: The chassis. This should be the same battery voltage as the (-) battery terminal (X) i.e. [+0.002Volts]. B: Earth tag. Again, measure the tag and not the washer or nut. Difference should be less than [0.008Volts]. It is a good idea to check the washer and the nut or bolt as this will show whether contamination is present. i.e. voltage measured at these points should be smaller than [+0.080Volts]. If not disassemble the earth connection and thoroughly clean all parts with a wire brush and contact cleaner. 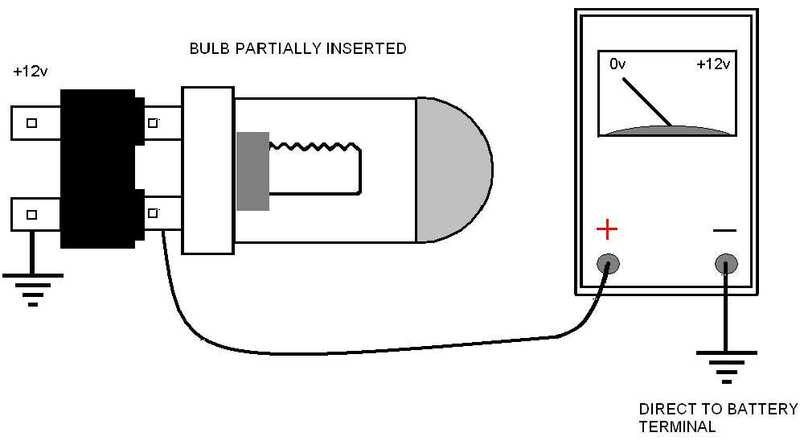 3: If the voltage measured in this step is greater than 0.5v of that measured at the battery terminal a fault is in the (+) feed to the bulb. To check this connection measure each side of the connector feeding the bulb (re-check battery (+) terminal to ensure voltage is greater than 11.5v. Do not disconnect the connector to measure the voltage as the load on the supply will be disconnected. 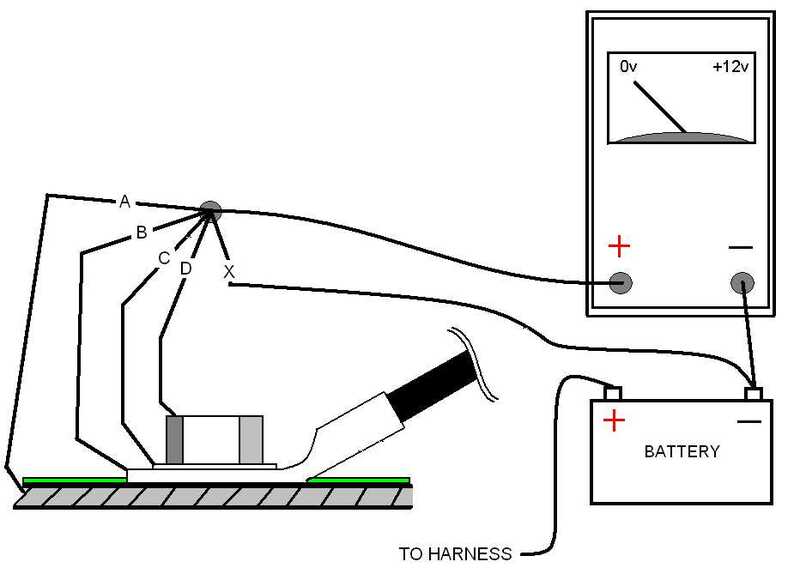 4: If the voltage measured in this test is greater than 0.01v check the Earth path as in step 1. (a) If the problem occurs while trying to start a vehicle (crank the engine over) measure battery terminal voltage (not clamps) while cranking if it is less than 11.5Volts check the condition of the battery and recharge or replace as necessary. (c) Remember to check the condition of large “Earth Straps” that connect the battery to the chassis, chassis to engine/gearbox for a low voltage drop using the “Fault Finding an Earth Point guide mentioned earlier. (d) Do NOT use “Scotch Lock” type connectors in any exposed areas of the vehicle as they are not weather or even splash proof and are designed for interior vehicle use only!. This type of connector uses a “blade” to pierce or slice the insulation as the “blade” is pushed into the connector body. Normally these connectors are blue in colour. If connections are to be made use .25” insulated spade and socket type connectors as these are corrosion resistant. Better still if your soldering skills are good, solder the wirers together and insulate them with “glue lined heat shrink sleeving” but ONLY if you are sure of the connection as it gets messy if you have to take it all apart again. (e) Do NOT be tempted to use “insulating tape” as it is only designed as a VERY temporary measure to get you out of a jam! It is not designed to be a permanent fix! Finally, I will not accept responsibility for any loss or damage that you may suffer using this guide.